What housing resources are available to provide mainstream permanent housing for homeless families? This section discusses the Federal programs that provide subsidized rental housing to low-income families and individuals. To understand the potential of each of these programs for serving families leaving homelessness, it is important to distinguish between two general types of programs: assisted housing programs and affordable housing programs. The key distinction is the system for determining the rent paid by the resident family. In affordable housing programs, all families within an income range (e.g., up to 50 percent of area median income) who occupy a certain size unit pay the same rent for that unit. The rent has been set at an affordable level by the owner of the housing development. The rules of the Federal funding program establish the maximum rent the owner may charge at 30 percent of the income that is the upper limit of the income range for the size household expected to occupy the unit—for example, 30 percent of 50 percent of area median income (i.e., 15 percent of area median income) for a 3-person family. The major affordable housing programs are the Low Income Housing Tax Credit (LIHTC) program and the HOME Investment Partnerships (HOME) program. Assisted housing programs are examined first, which, of the two groups of programs, is the more likely to be usable by parents who have become homeless and are seeking permanent housing. Because assisted housing programs charge rent on the basis of actual income, however low, any family exiting homelessness should be able to afford to live in an assisted housing unit. Administrative data collected by HUD make it possible to know a great deal about the units in the assisted housing programs: how many there are, how many bedrooms they have, whether families with children are living in them, and where they are. In 1998 HUD released a public-use data set called Pictures of Subsidized Housing that contains this information.6 The estimates of numbers of units in Exhibit 3 are based on the percentage distributions of different types of assisted housing units as of 1998 but updated to reflect the numbers of public housing, project-based Section 8, and voucher units as of 2004 that are shown in January 2005 HUD budget materials (U.S. Department of Housing and Urban Development [HUD], 2005a). Of the 4.8 million total units of assisted housing, 2.6 million have two bedrooms or more and potentially could be occupied by families with children. More than half a million of these assisted rental units (511,000) turn over each year and might be used by families exiting homelessness. Exhibit 3 shows how these units are distributed across the three major programs and also shows how many have more than two bedrooms. 1 Units produced under the Section 8 Moderate Rehabilitation program are classified as belonging in Section 8 projects. This is the “mainstream” Section 8 Moderate Rehabilitation program, which has many units with multiple bedrooms, as distinct from the “SRO Moderate Rehabilitation” program, which is one of the HUD McKinney-Vento programs for the homeless and has mainly zero or one-bedroom units. Public Housing. The oldest of the assisted housing programs (created in 1937), public housing now has approximately 1.2 million units. Fewer than half of those units, approximately 570,000, have multiple bedrooms. While the popular image of the public housing program is that of a family program, a large portion of the program consists of developments that have been designated for occupancy by the elderly. In addition, “general occupancy” public housing developments often have some zero or one-bedroom units, as well as units with multiple bedrooms. The public housing program is not growing. New units of public housing have been produced in the past 2 decades in very small numbers and only when a public housing authority (PHA) has received capital funds that may be used to replace public housing units that have been demolished or otherwise retired from the stock of public housing. The current (as of 2005) scenario is that a few PHAs may be able to amass sufficient “replacement factor” capital funds to undertake the development of new projects. Such developments would not add to the overall stock of public housing that might serve families leaving homelessness. On the other hand, it might be possible to persuade one or more PHAs to agree that some (or all) units in a replacement factor project should be used for parents who are exiting homelessness. 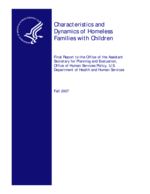 The use of replacement factor funds requires approval from HUD. The number of multiple bedroom public housing units has dropped slightly over the past decade, as distressed public housing developments have been redeveloped under the HOPE VI program or otherwise retired from the public housing stock. The estimates in Exhibit 3 reflect the loss of about 100,000 public housing units since 1998 and are based on an assumption that most of the reduction has been in family units. Many of those units are not lost to the entire system of assisted housing, because demolished public housing units are replaced by Housing Choice Vouchers. For the public housing program as a whole, recent analysis of administrative data shows that between 10 and 14 percent of all households in the program are newly admitted each year (HUD, 2002). An analysis focusing just on families with children suggests that 18 percent of units occupied by families with children become vacant each year (Lubell, Shroder, and Steffen, 2003).7 Applying this 18 percent rate to public housing units with two or more bedrooms, it is estimated that 103,000 units that could be occupied by families turn over each year, including units with two bedrooms and units with three or more bedrooms (Exhibit 3). Public housing developments are owned and operated by PHAs. Both the capital and the operating costs for public housing are funded by grants from the Federal Government. Waiting lists for the program are maintained by PHAs and, in recent years, Federal law has given PHAs fairly broad discretion for setting priorities for who gets selected from the waiting list to fill vacant units on the basis of income level, household type, and other preferences that could include, for example, work effort or special needs. Project-based Section 8. Project-based Section 8 is actually a family of programs that produced subsidized rental housing during the 1960s, 1970s, and 1980s. Section 8 projects either were built in the first place with rental subsidies that follow the assisted housing rules (30 percent of actual income is charged for rent) or had such Section 8 subsidies added to them later in order to make them more affordable for current residents or to help maintain the financial viability of the housing developments, or both. Section 8 projects are privately owned, and the private owner contracts directly with HUD to receive for each occupied unit a subsidy equal to the difference between 30 percent of the household’s income and a total rent agreed to by HUD as necessary to operate the housing development and pay its debt. Private owners of Section 8 projects have somewhat less discretion than PHAs to set their own priorities for their waiting lists, and many owners take households from their waiting lists on a first come, first served basis. They may—and most do—screen potential tenants for such things as credit ratings, rent payment histories, and criminal records. As shown by Exhibit 3, there are 609,000 multiple bedroom units that might be occupied by families with children in privately owned Section 8 projects. About 408,000 of these units have two bedrooms, and 201,000 have three or more bedrooms. It is assumed that the annual turnover rate for family units is the same as for public housing, 18 percent. Thus, 110,000 units that could be occupied by families with children become available each year, including units with two bedrooms and units with three or more bedrooms. Like public housing, the project-based Section 8 program is shrinking at a modest rate, rather than growing. Owners of Section 8 projects have the legal authority to end their contracts with HUD when those contracts come to the end of the term (the number of years) originally agreed to. Many Section 8 projects have reached that “opt out” point, and some owners have chosen to leave the program and convert their property to market rate rental housing or to something else. The numbers in Exhibit 3 reflect a reduction of about 5 percent of the project-based Section 8 units between 1998 and 2004. As is the case for public housing, some of the “lost” units have been replaced by vouchers, and these increases in the size of the voucher program are reflected in Exhibit 3. Housing Choice Vouchers. Housing Choice Vouchers are tenant-based rather than project-based. Families and individuals use subsidies administered by PHAs (usually, but not always, the same entities that own and operate public housing) to rent private market housing. The housing must pass a housing quality inspection, and the landlord must be willing to participate in the program. Vouchers do not have a predetermined distribution of unit sizes. As a household comes off a PHA’s waiting list, the PHA issues a voucher for the unit size needed by the household. In the earliest years of the voucher program and its predecessor Section 8 certificate program, PHAs kept separate waiting lists for different unit sizes, but that practice ended many years ago. Over time the voucher program has become a program serving mainly families with children. As shown by Exhibit 3, more than 1.4 million of the approximately 1.9 million vouchers are used to rent units with two or more bedrooms: 779,000 in two-bedroom units and 646,000 in units with three or more bedrooms. The voucher program is by far the largest component of assisted housing for serving families with children. The annual turnover rate for vouchers is 21 percent (Lubell, Shroder, and Steffen, 2003). Assuming that families with children come to the top of waiting lists at the same pace as before, it is estimated that 299,000 vouchers each year become available for use by new households. PHAs administering the voucher program have been given increased flexibility to determine their own priorities among the households on the waiting lists for the program. During the 1990s, the funds appropriated by Congress for additional vouchers often included special set-asides of units for the homeless or for people with disabilities, but these set-asides have disappeared and the units have been absorbed into the mainstream voucher program. In addition, housing legislation in the late 1990s eliminated a system of Federal preferences that put at the top of voucher waiting lists households with extreme rent burdens (paying more than 50 percent of their income for housing), households living in substandard housing, and people who were homeless. Instead, an income-based rule applies: at the time vouchers are first used, 75 percent of those using them must have incomes below 30 percent of the local median (“extremely low” incomes). Subject to this constraint, PHAs can set their own preferences for admission to the voucher program. Exhibit 4 compares the NSHAPC-based number of families with children who need permanent mainstream housing from Exhibit 2, and the unit sizes they need, with the annual turnover of assisted housing units from Exhibit 3. To compare annual turnover in assisted housing with a very rough estimate of the number of parents leaving homelessness with children during the course of the year, the point-in-time estimates shown on Exhibit 2 have been multiplied by 3. There are about three units of assisted housing turning over each year for every homeless parent who needs permanent mainstream housing. Furthermore, for the nation as a whole, there is no relative shortage of units that could serve families who need three or more bedrooms. The ratio of units turning over to needs for such units is almost 5 to 1. Almost 60 percent of the units potentially available to parents who have become homeless and their children are in the Housing Choice Voucher program, close to 300,000 units. There are slightly more family units in the privately owned Section 8 stock than in the public housing program, although the public housing program has substantially more units turning over each year for families who need three or more bedrooms. The next two sections (2.2 and 2.3) examine the degree to which the affordable housing programs, HOME and the LIHTC, may provide an additional potential resource for families leaving homelessness. Section 2.4 discusses the barriers that may prevent parents who have become homeless from using assisted or affordable housing and describes some strategies for overcoming those barriers. Since 1990, most of the growth in rental housing subsidy programs has been in affordable housing rather than assisted housing. The LIHTC was enacted in 1987 and, as of 2004, had produced about 1.2 million units of rental housing. In other words, the program is about the same size as the public housing program, and unlike public housing it continues to grow each year. The HOME program was enacted in 1990 and is a block grant to cities and states that can be used for a variety of purposes, including the production of rental housing and tenant-based rental assistance, as well as subsidies to homebuyers and homeowners. Each year, authority to allocate LIHTC tax credits to developers of rental housing is issued to the states by the Internal Revenue Service, initially in an amount of $1.25 per capita, which was increased to $1.75 per capita in 2002 and indexed to inflation thereafter. The total annual tax credit authority (the equivalent of the program’s budget) is about $5 billion (Climaco et al., 2004). HOME is based on appropriated funds allocated to local governments and states through a needs-based formula. Its annual budget in recent years has been around $1.9 billion. The use of HOME funds is based on a plan that each state or local participating jurisdiction must develop as part of the jurisdiction’s Consolidated Plan for using HUD funds. The Consolidated Plan process includes public hearings and other opportunities for input from advocates and provider organizations. Most jurisdictions use a substantial part of their HOME allocation for the production of rental housing. Information is not available on the number of bedrooms in HOME units, but as of 2002, 48 percent of HOME rental production units served two to four people, and another 7 percent served five or more people (Turnham et al., 2004). Assuming that all of these units have two or more bedrooms, 55 percent of the HOME program may be usable by families with children, about 120,000 units as of early 2005. In addition, there is a “pipeline” of 66,000 HOME units with two or more bedrooms for which funds have been committed but which have not been completed. At current budget levels for the HOME program, funds could be committed for an additional 15,000 units with two or more bedrooms each year (Exhibit 5, based on HUD, 2005b). As a “flat rent” program (with maximum rents generally 30 percent of 50 percent of area median income), HOME rental production does not necessarily produce housing that families leaving homelessness with limited earnings or benefit income could afford. However, a substantial fraction (42 percent) of units in HOME rental projects does serve households with incomes below 30 percent of area median income (HOME Program National Production Report, June 2005). In many cases, this is because of the families and individuals using Housing Choice Vouchers occupy the HOME units. About one-fifth (22 percent) of HOME rental production units are occupied by households with tenant-based assistance, and another 18 percent have some other type of rental subsidy (Herbert et al., 2001). Thus, there are only a few HOME rental production units (probably less than 5 percent) that do not also have an assisted housing subsidy but nonetheless have flat rents low enough to be affordable for poor homeless families. In addition to rental production, state and local participating jurisdictions may use HOME funds for tenant-based rental assistance similar to vouchers. Tenant-based rental assistance is a relatively small use of HOME. About 15,000 units are subsidized each year, typically for 2-year periods, with a total of 123,000 households ever subsidized as of 2005.9 Sixty percent of the households using HOME tenant-based rental assistance have two to four members, and another 12 percent have five or more members (Turnham et al., 2004). As of 2004, it is estimated that 22,000 families with two or more members were using HOME tenant-based rental assistance. HOME tenant-based rental assistance it is heavily used for households with extremely low incomes: 81 percent have incomes below 30 percent of area median. There is anecdotal information that HOME tenant-based rental assistance is often used for special needs housing and that participating jurisdictions’ choice to fund tenant-based assistance results from demand for that use by advocacy and provider groups. It is not known whether this is permanent supportive housing or mainstream permanent housing targeted for use by families and individuals with special needs. 1Assumes all tenant-based rental assistance used by more than one person serves families. The total two- or more bedroom units is an estimate of the number of units under subsidy at a point in time. HOME tenant-based rental assistance typically is only committed for 2 years, so the total commitments since the beginning of the program, 123,000 as of 2005, do not equate to a current program size. It is assumed that incremental use of HOME for tenant-based rental assistance sustains the current program level by renewing subsidies for current households. 2It is assumed that the size distribution of units placed in service 1987-94 and 2003-2004 is the same as the size distribution of units placed in service 1995-2002. LIHTC. States use their annual allocations of LIHTC authority on the basis of a Qualified Allocation Plan (QAP) that, like the Consolidated Plan that informs the use of HOME funds, provides an opportunity for public input. There is no national administrative data on LIHTC. HUD conducts each year a survey of the state agencies that administer the LIHTC program, collecting information on some of the characteristics of the rental developments placed in service that year, including the number of bedrooms in each unit in the development and the development’s address. A survey conducted in the early 1990s by the General Accounting Office (GAO) provides the only information on the occupants of LIHTC developments, and that information is both limited and dated. Thus, little information is available on the incomes of the households occupying LIHTC units (other than the presumption that, when they moved in, they had incomes below the program’s usual limit of 60 percent of area median income) or on the rents actually charged in LIHTC developments (as distinct from the maximum rents permitted by the program rules, usually 30 percent of 60 percent of area median income). Approximately 40 percent of all LIHTC developments placed in service between 1995 and 2002 have at least one household using a Housing Choice Voucher (Climaco et al., 2004). The administration of the LIHTC program on the state level should provide an opportunity to coordinate the development of LIHTC housing with state programs focused on mental health, developmental disabilities, substance abuse, and other special needs. The extent to which LIHTC is used by states for developments targeted for occupancy special population groups is not known, although there is anecdotal evidence that some states create set-asides of this nature.10 LIHTC developments—or set-asides of units within developments—could be used either for mainstream permanent housing or for permanent supportive housing. About 30 percent of LIHTC developments have nonprofit sponsors. Developments with nonprofit sponsors may be particularly likely to serve families with vouchers or to set rents lower than the LIHTC maxima on the basis of multiple sources of subsidy, often including HOME funds. Besides HOME, other supplementary subsidies that can make it possible to cover a development’s costs at rents that are more affordable for families with extremely low incomes include the Federal Home Loan Bank Board’s Affordable Housing Program (AHP) and the Community Development Block Grant (CDBG) program. Nonprofit owners may be especially willing to agree to long-term rental arrangements with providers of services for special needs populations. The data set based on the annual survey of state agencies provides information on the number of LIHTC units placed in service between 1995 and 2002 that have multiple bedrooms. Based on that information (Climaco et al., 2004), Exhibit 5 provides estimates of the numbers of LIHTC units with two bedrooms and with three or more bedrooms placed in service between the first year of the program and 2004. As of 2004 there were a total of 880,000 units that potentially could be occupied by families with children. There is less information about the rate at which HOME and LIHTC units turn over than there is about the assisted housing programs. It is likely that affordable housing units turn over at a more rapid rate than assisted housing units because they are less likely to represent a unique opportunity for the households occupying them to live in units they can afford. With flat rents at 15 or 18 percent of area median income, HOME and LIHTC units often are in competition with other moderately rental priced housing in the same area, and residents of housing with flat rents may have incomes at a level that makes it possible for them to buy moderately priced homeownership units. Typical market rate rental housing turns over at about 50 percent per year, but this includes many childless households with very high mobility rates. If it is assumed that a 25-percent turnover rate—higher than assisted housing but substantially lower than for all types of households in market rate rental housing—there are 30,000 multiple bedroom units in HOME rental developments and 220,000 units in LIHTC developments that become available each year for occupancy by new families. In addition, these programs have current pipelines that are likely to include 66,000 units of multiple bedroom rental housing (HOME) and 120,000 units (LIHTC). At current budget levels, there will be further annual increments of 15,000 HOME units and 60,000 LIHTC units (Exhibit 5). It is not appropriate to add together assisted housing units, HOME rental development units, and LIHTC units, because many HOME and LIHTC units are also assisted housing units (residents use vouchers or the units also have project-based Section 8 subsidies). In addition, HOME and LIHTC often are used for the same developments and units. Exhibit 6 provides the order-of magnitude estimates of the total units of assisted and affordable rental housing that have multiple bedrooms and that might be available to parents leaving homelessness. The estimates for affordable housing do not include units that have housing assistance, and they do not double count units that have both LIHTC and HOME subsidies.11 Based on turnover of rental units already placed in service and of current voucher slots, there are 721,000 units each year that might be used by families with children attempting to leave homelessness for mainstream permanent housing. The assisted and affordable housing programs have almost 3.5 million units of subsidized rental housing large enough for families with children, and it is likely that about 720,000 million of these units turn over each year (Exhibit 6). By comparison, there are only 55,000 parents who are homeless at a point in time who need mainstream subsidized rental housing (Exhibit 2) and perhaps three times (166,000) that number over the course of a year. In theory, then, with a ratio of more than 4 to 1 between units available and units needed, the assisted and affordable housing programs should provide a substantial source of permanent housing for families leaving homelessness. Inappropriate locations of some assisted housing developments. Thus, more than 2 million housed families are in direct competition for assisted housing with the 50,000 families who are homeless and seeking mainstream assisted housing. Some of these housed families may recently have experienced a drop in income or a change in household composition, or they may expect their poverty to be temporary, or they may have other reasons for not placing themselves on waiting lists for assisted housing. However, at any point in time, many families with severe housing needs will have been on waiting lists for assisted housing for months or for years. Under a first-come-first-served system or a system that provides only an income-based preference for extremely low-income households, these housed families will be selected from waiting lists ahead of homeless families entering the waiting lists more recently. One approach used by homeless service providers for overcoming this barrier is to help families apply for assisted housing as soon as they have entered a shelter or a transitional housing facility, so that when they are ready to move to permanent housing some months in the future, they will be at the top of the list. How successful this approach can be depends on the length of waiting lists for assisted housing, which varies a great deal from location to location. It also may not help much for implementing a policy that tries to get families out of shelters or transitional housing facilities and into permanent housing as quickly as possible. A more direct approach is to persuade PHAs to give people who are homeless a preference for receiving a voucher or a vacant public housing unit. PHA staff (and boards of directors) may be reluctant to establish a general preference for people who are homeless, especially in a jurisdiction where there is a large shelter population, for fear of crowding out other needy families who are precariously housed. In addition, PHAs or private owners of assisted housing developments may be reluctant to add families with histories of special needs to rental developments that already have a concentration of families with challenges. An alternative is for providers in the homeless service system to negotiate with PHAs, or with owners of Section 8 projects, for a set-aside of vouchers or of units in a development for occupancy as needed by graduates of the provider’s program. It is important for advocacy organizations and providers to remember that PHAs are not the only providers of assisted housing and to take the effort required to reach out to private owners of Section 8 projects. The fact that the Section 8 projects in an area have many different owners in a local area may actually have some advantages, because special arrangements may be simpler to achieve than with PHAs. For a PHA such arrangements may imply policy decisions for all of the public housing projects—or vouchers—in a local area and require the approval of the PHA board. Affordability of HOME and LIHTC Rents. The median income for homeless families is only 41 percent of the poverty income level, and most HOME and LIHTC rents are not affordable even by families with incomes at 100 percent of poverty, unless those families are using a housing voucher. There may be some homeless families that have incomes at a level low enough that they need affordable housing but high enough to afford HOME and LIHTC flat rents. For example, some parents may become homeless because of domestic violence or temporary behavioral health issues but have sufficient human capital to have jobs at which they earn between 40 and 60 percent of area median income at the time they leave homelessness for permanent housing. For families who are able to obtain Housing Choice Vouchers, HOME and LIHTC developments can serve as available housing in which to use the voucher. This is not always the case for LIHTC developments, which, depending on the part of the country in which they are located, often are permitted to have rents above the voucher program’s payment standard. This happens in locations that have relatively low private market rents (on which voucher payment standards are based) compared with local median incomes (on which LIHTC maximum rents are based). One of the ways to make HOME and LIHTC developments available for families leaving homelessness, with and without vouchers, is for providers to negotiate with owners for a set-aside of units within the development to be made available, as needed, to the provider’s clients seeking permanent housing. A good time to do this is when the rental housing developer is applying to the state or locality for an allocation of HOME dollars or LIHTC tax credit authority, because such a commitment may make the proposed development score higher in the competition for these resources. On a system-wide level, advocates can encourage the state and local agencies administering the affordable housing programs to give such arrangements priority in the competitions for HOME and LIHTC. Shifting Priorities of Housing Programs. The most recent enacted legislation affecting the assisted housing programs, the Quality Housing and Work Responsibility Act (QHWRA) of 1998, accelerated a trend toward giving PHAs more discretion over both the management of their waiting lists and the rents charged for assisted housing. The earlier system of Federal preferences, which included homelessness and otherwise favored the poorest households, was replaced by requirements that 75 percent of the newly issued vouchers go to households with incomes below 30 percent of area median, and that only 40 percent of households newly admitted to public housing or project-based Section 8 have such extremely low incomes. Because the income-based subsidy formula is such a powerful force in targeting assisted housing to the poorest households and because of decisions made by many PHAs to continue to serve the neediest households, the incomes of families in the assisted housing programs did not change much following the enactment of QHWRA. As of 2001, 71 percent of families and individuals living in public housing had incomes below 30 percent of area median, and 75 percent of families using vouchers had these extremely low incomes (HUD, 2002.) However, there is a parallel and growing trend to move away from 30 percent of income rents in order to create incentives to work within the assisted housing programs.13 A number of PHAs have been given the authority to do this under a demonstration called Moving to Work. In addition, under the basic QHWRA authority, PHAs may establish preferences for families with employment income. Furthermore, current proposals for “rent reform” favored by some PHA interest groups could make alternatives to 30 percent of income rents applicable to the assisted housing programs as a whole (Public Housing Directors Association, 2005). Another shift in the priorities for Federal programs that may affect the availability of subsidized housing for families with children is the increased emphasis on using HOME for homeownership rather than rental activities. However, even though there is now a set-aside of HOME funds that must be used for first-time homebuyer programs, the fundability of HOME funds means that so far there has not been an appreciable drop in the overall percentage of HOME funds used for rental housing production or for tenant-based rental assistance (HUD, 2005b). Occupancy Requirements. Both PHAs and private owners are permitted by law and regulation to screen tenants for their ability to be lease-compliant tenants before offering them a unit in a public housing or Section 8 project. Screening often includes checks on credit history, on criminal records of household members, and on whether the family has a history of eviction from rental housing for nonpayment of rent or for other lease violations. Such screening may be difficult for some parents attempting to move from homelessness to permanent rental housing. Providers in the homeless service system report, in particular, that many of their clients have been evicted from housing in the past. Many have lived in assisted housing at some point in their lives, and some are barred from waiting lists for vouchers and public housing because they have outstanding debts to the PHA. In the past, PHAs were less rigorous than private owners of Section 8 projects in screening families before admitting them to public housing. That is now changing, as PHAs attempt to create mixed-income communities in public housing developments. In addition, the retirement from the public housing stock of many of the most distressed public housing developments means that PHAs that formerly would take virtually anyone in order to fill vacant units no longer feel that pressure to the same extent. For the Housing Choice Voucher program, major responsibility for screening prospective tenants rests with the owners of the private market rental housing in which families seek to use the voucher, rather than with the PHA. However, PHAs now screen families for criminal records during the process of qualifying them to receive a voucher, and they also may disqualify households that have violated voucher program rules in the past. Private owners of rental housing may legitimately refuse to rent to voucher holders for any of the same reasons, such as poor credit history, that they may refuse to rent to unsubsidized households. Occupancy requirements can also present a challenge for retaining formerly homeless families in assisted housing. Anecdotal information from homeless service providers suggests that eviction from public housing or loss of subsidies under the voucher program because of rule violations may be a common path into homelessness. Ways of overcoming these barriers to the use of the assisted housing programs by families attempting to leave homelessness include making payment of outstanding housing debts and repair of other credit problems immediate goals for parents who become homeless. A homeless service provider can also play an active role in the housing search process, making assurances to an owner of rental housing that a family will continue to receive case management and other support during a period of stabilization in permanent housing. It may even be possible for some providers to guarantee rent payments—for example, based on a revolving fund set up for this purpose. Overcoming criminal records may be more difficult, and it may be that criminal histories recent enough to bar them from admission to assisted housing may be a characteristic worth including in a typology of homeless families. Discrimination. In addition to the legitimate reasons owners of rental housing may refuse to accept families, such as a prior history of nonpayment of rent, private owners may discriminate against families simply because they have been in shelters. The owner may believe that becoming homeless is a predictor of disruptive behavior or lease violations. And homelessness may simply bring with it a stigma with which owners do not wish to be associated. There may be a few jurisdictions that include people who have been homeless among those protected by fair housing law. Another type of discrimination, clearly protected by fair housing law but nonetheless common, is discrimination against racial and ethnic minorities. The most recent study of housing discrimination in U.S. metropolitan housing markets, based on paired testing conducted in 2000, found that, among those seeking rental housing, African Americans received unfavorable treatment compared to Whites 21.6 percent of the time.15 For renters, the adverse treatment measured included “the availability of advertised and similar units, opportunities to inspect units, housing costs, and the encouragement and assistance from rental agents.” (Turner, Ross, Galster, and Yinger, 2002). Once again, the most effective way of overcoming these barriers may be active participation in the housing search process by homeless service providers. Reaching out to owners of rental housing and informing them about the ongoing support families leaving homelessness will receive in permanent housing can help allay stereotypes associated with minority status, with disabilities, or with homelessness itself. Inappropriate Locations. A final barrier to the use of the 720,000 units of assisted and affordable housing that turn over each year by parents who have become homeless may be that assisted housing projects and programs are located in the wrong place. This could happen in a number of ways. For example, some public housing and Section 8 developments may be located in neighborhoods where it is hard for people recovering from substance abuse to remain clean and sober, and programs helping homeless people overcome such challenges may not want to encourage their clients to seek housing in those places. Another challenge may be that some public housing or Section 8 developments in metropolitan areas may be in locations from which it is not easy to find jobs or to travel to work. Or they may require a child to leave a school in which he has become stabilized or to move away from a relative who provides important emotional support. The inflexibility of assisted housing with a fixed location also may result in parents living in places that are inconvenient for continuing their treatment programs. In rural areas, assisted housing may be in locations too far from the locations where parents have become homeless or are receiving services to help them leave homelessness. The NSHAPC suggests that as many as 20 percent of parents who become homeless are in nonmetropolitan areas. A substantially higher proportion of assisted and affordable subsidized housing is in nonmetropolitan areas, but there nonetheless may be a mismatch between the locations of housing subsidies and the locations of homeless families. For project-based assisted housing in particular suburban and rural areas, there may be a mismatch between unit sizes and the numbers of bedrooms needed by families trying to leave homelessness for permanent housing. Finally, victims of domestic violence may need to find permanent, affordable housing in locations where they will be safe from their abusers. Housing vouchers may be a more appropriate form of permanent housing for victims of domestic violence than public housing or Section 8 projects, especially in cities that are small enough that there are only a small number of easily identifiable public and assisted housing developments.